COLUMBIA COUNTY, FL – GasBuddy, the leading source of real time gas prices in America, reported earlier today that with a backdrop of gas prices that have risen sharply in the last two weeks, "motorists are sure to be upset: they’ll be paying $4 billion more in gasoline taxes in 2018 than they did in 2017. That’s $76 billion or $208 million every day, up from the $72 billion total in 2017." The rise comes out to an average increase of about 2.6 cents per gallon, but all states are not equal: California gas taxes climbed 15.3 cents to 73 cents per gallon, a rise of over 25% versus 2017. 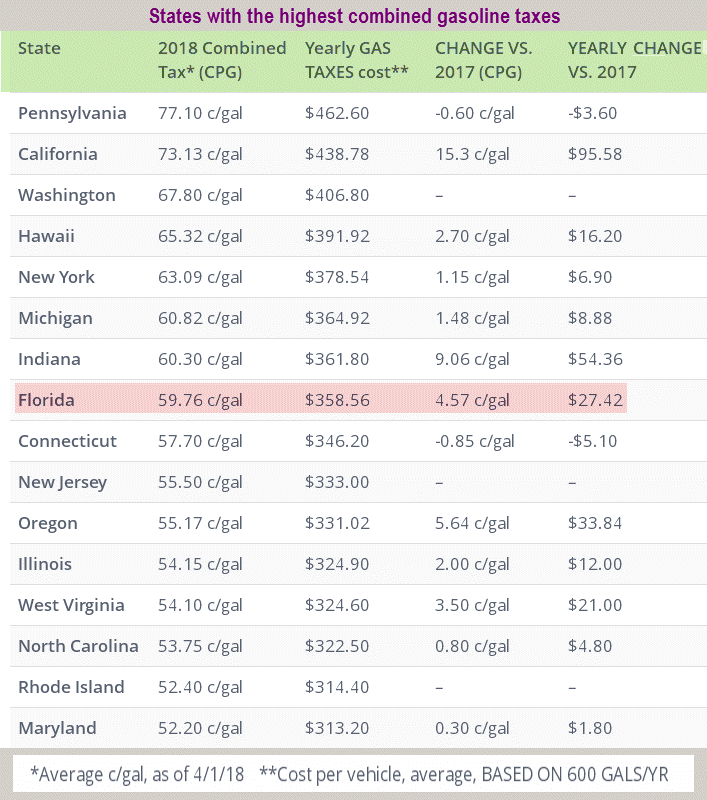 While Pennsylvania still leads the nation with the highest combined gas taxes, over 77 cents per gallon, it saw its gas taxes fall 0.6 cents per gallon. Motorists and truckers should be aware of the possibility of a rise in the federal gas tax rate, which has remained unchanged at 18.4 cents per gallon since 1993. Every penny rise in the federal gas tax would lead America’s annual spending on fuel to rise by $1.46 billion. In February, President Trump endorsed a 25-cent hike to the federal gas tax levy.